We are nearing to the end of the school term! (How quickly has that flown by?!) The kids are bouncing off the walls because they’re excited to play in the sun for six weeks and the teachers are just as excited to go into hibernation mode until September arrives! 1. Begin by downloading and printing both pencil gift box templates. Cut out all the elements. 2. 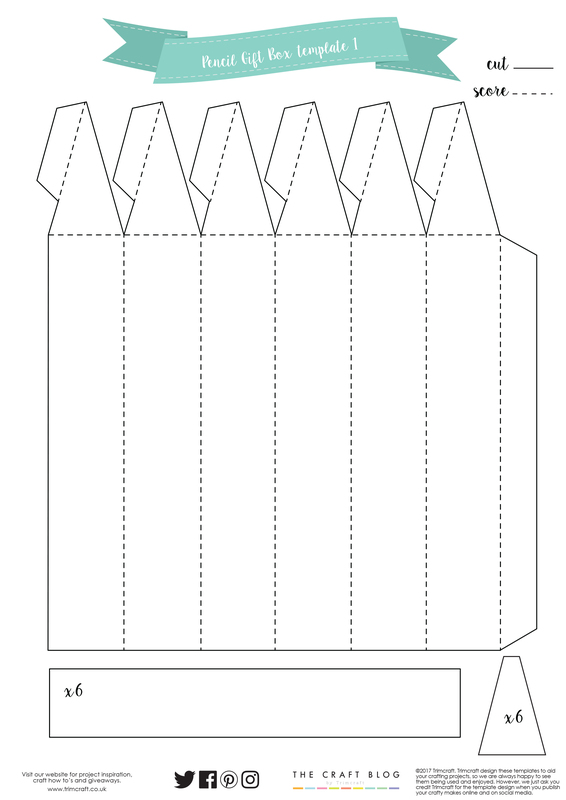 Draw around the large template on the first printable onto a piece of black Dovecraft A4 card stock. Score and cut where shown. On the first printable, cut out the rectangle onto Dovecraft yellow card, 6 times. Cut out the triangular shape out of the woodgrain paper from the First Edition Love Story 6x6 paper pad 6 times. 3. From the second printable, cut the thinnest rectangle out of Dovecraft A4 mirror card, the largest rectangle and the hexagon shape on to a piece of Dovecraft A4 pink card as shown below. 4. Adhere the yellow panels with Dovecraft Perma Fix onto the black template, in between the score lines ensuring there is an equal gap between each panel. 5. Stick the 6 woodgrain triangles you cut out along the top of your template in the triangular sections. Ensure that that there is a border left around each triangle before you adhere. 6. Follow the printable and score the pink rectangle you cut out. Adhere this along the bottom of your template. Wrap your pencil template together and with Dovecraft Perma Fix, adhere the top of the pencil together using the tabs provided. 7. Use a thinner roll of Perma Fix tape to adhere the mirror card strip around the top of the pink section on your box. 9. 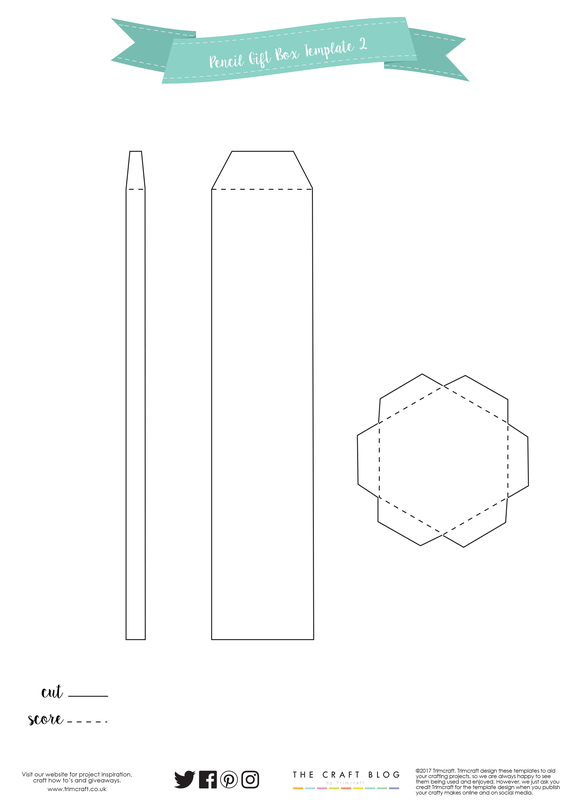 Score the pink hexagon you cut out as shown on the printable and slot into the end of the pencil, this will be the lid for your gift box. 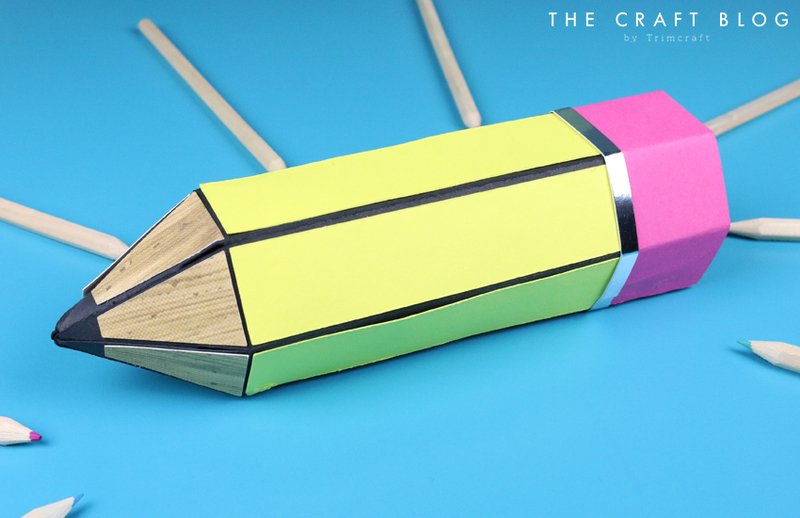 How COOL is this pencil gift box? Your child’s teacher is going to be so chuffed with this design especially when they find out there is a thoughtful present hidden inside! This gift box is the perfect way to say thank you and is brilliant for holding chocolate, toiletries and more! How will you use our free templates to thank your favourite teacher? We would love to see so don’t forget to #trimcraft and @kathycraftstv when sharing to social media and to share your makes in the Inspiration area! Super cool idea, that the kids can easily make themself even. Will let the girls try it, when they come here next time before going back to school.